The Yard Machine Electric Lawn Mower is a very good mower. 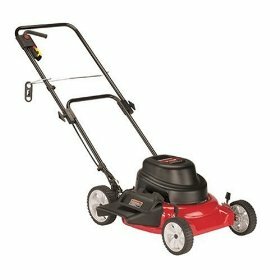 It has the power to cut long grass that you would imagine would require a gas powered mower. Say good bye to the pull starting of the gas power with a simple push of a button you are off and running. Say good bye to the cost and mess with dealing with gasoline, and changing oil. There is very little maintenance that is required with the electric Yard Machines. There are only two drawbacks to using the electric mower. The biggest drawback is the cheap quality of the switch/plug assembly. It is made of cheap plastic and the clip that hold the cord in will break off. You are not able to replace this item according to customer service. My solution is simply to duct tape the cord in. Tacky? Yes but it has held for 2 years. The second drawback is the need to plan your cutting so that the electric extension cord (not included with the mower) will lie in the cut area, otherwise you will spend a lot of time bending and moving the cord. You also need to think ahead when working around obstacles like trees and clothes lines. Despite these shortcomings I will never go back to gas powered mower. The pros of not getting a sore back starting the machine, not having to run up to the gas station to fill cans to cut the grass, putting the smelly can in the car, far outweigh any inconvenience caused by having an extension cord in tow.